Jim Crockett Promotions put on a holiday spectacular at the Richmond Coliseum on Monday night, December 27, 1976 that the fans that were there and witnessed it would never forget. The fact that the card was held on a Monday night was perhaps a sign that something big might be in store, as Richmond's wrestling cards were regularly held on Friday nights. Additionally, there was a three-week buildup to this card where typically Richmond had a card every week. As it would turn out, the big buildup was justified, as fans on this historic night saw the greatest feud in Mid-Atlantic Championship Wrestling end, and in the same match, breathed a collective sigh of relief when their greatest hero prevailed and would be able to return to the Coliseum and wrestle again. MAIN EVENT---Blackjack Mulligan versus Paul Jones for Mulligan's United States Heavyweight Title. While a terrific bout, this match would pale in comparison to the semi-final match that preceded it. This Mulligan-Jones tussle saw tremendous heat between these two, as it came on the heels of Mulligan having the U.S. belt returned to him two weeks earlier by NWA President Eddie Graham. Mulligan had filed a protest with Graham after it appeared Jones had beaten him in a match for the U.S. Title, but it was ruled that Jones' feet were outside the ring ropes when he pinned Mulligan. Paul was furious, saying that Blackjack had resorted to a "technicality" to save the U.S. belt. Mulligan countered saying that "the rules apply to everyone." In this main event battle, Jones came out red-faced and determined, attacking Mulligan with a flurry of closed fists before Blackjack even took his championship belt off. Paul then choked Blackjack with Mully's own vest and it appeared that Mulligan would retain the U.S. Title by disqualification before the match even officially started! "Number One" followed up on his initial advantage and stayed on top of Blackjack during the early portion of the match. It appeared early on that Jones would recapture the title that Eddie Graham had just given back to Blackjack. However, around the ten-minute mark Mulligan caught Jones and threw him through the ring ropes and Paul hit the floor hard. Mulligan dominated Jones on the outside, and threw a weakened Jones back into ring and soon thereafter was able to put his claw hold on Jones. While Paul survived the claw, he never seemed to fully recover from its effects. As the match wore on, Jones became enraged when he could not get Mulligan to submit to his Indian Death Lock leg hold. After the referee broke the hold for the third time, Jones rushed Mulligan who was slumped in the corner of the ring and tore into him. The referee could not pull Jones off of Mulligan, and after about a minute of this had to call for the bell, disqualifying Jones. Paul's volatile temper got the better of him, and while Jones clearly won this battle, he lost the war in that he did not capture the United States Title on a night where he without question was the better man. As history would have it, Paul Jones would never again hold the United States Title that had meant so much to him in 1975 and 1976. In fact, this bout was one of the last between Jones and Mulligan over the U.S belt, as Jones would leave the area in early 1977 and by the time he came back in the summer of 1977, Mulligan had lost the U.S. Title to Bobo Brazil. In my mind, this was the last great match between these two in what was an outstanding feud over the United States Heavyweight Title. SEMI-FINAL---Ric Flair versus Wahoo McDaniel for Flair's Mid-Atlantic Heavyweight Title. Stipulations: No Time Limit, No Disqualification, There Must Be A Winner, and Wahoo would never wrestle in Richmond again if he didn't win the title. This match "stole the show" and was really what packed the Coliseum on this cold late December night. Ric and Wahoo had a number of classic confrontations during 1976, but none of them had the stipulation that had all the fans on edge this night. If Wahoo didn't win the belt, he would never be able to wrestle in Richmond again. Everyone who entered the Coliseum knew that when they left the building, they would either be euphoric with Wahoo being the new Mid-Atlantic Heavyweight Champion, or crestfallen knowing they had seen Wahoo wrestle his last match in Richmond. With these stipulations, there would be no "in between" emotions after this bout was over. The "Nature Boy" entered the ring cockier than ever, as the night before he had become one half of the NWA World Tag Team Champions with partner Greg Valentine. Even before the referee had finished giving the wrestlers their instructions, Ric reached over and slapped Wahoo in the face. The "Chief" retaliated in kind, and the match got off to a rousing start. Wahoo controlled much of the early going with his patented chops, keeping Ric off guard and making it difficult for the champion to mount much of an offense. The tide didn't turn appreciably until Flair utilized a foreign object and cut Wahoo on the forehead badly. The Nature Boy taunted the enraged crowd, seemingly having Wahoo on the verge of defeat. At this point, Ric was even able to get on the house mic, telling the crowd that they better say goodbye to Wahoo forever. Flair then looked at a bloodied Wahoo and yelled, "bye bye Wahoo." But Flair made a fatal mistake of giving the proud Indian a chance to recoup, and Wahoo hit Flair with a low blow and immediately threw Flair over the top rope. In any other match, Wahoo would have been disqualified for such a tactic, but in this no DQ match this maneuver gave the Chief an advantage he would never relinquish. While outside of the ring, Wahoo rammed Flair's head into one of the ring posts, bloodying Ric's head badly. When the two finally got back into the ring, both were bloody messes but the intensity of the match even intensified! From this point on, the battle was ferocious as Wahoo chopped and Flair punched. Finally, the Chief was able to catch Flair in position for a devastating suplex, and from there followed up for a clean pinfall victory! While the noise from the Coliseum crowd was deafening as Wahoo was presented with the prized Mid-Atlantic Heavyweight Championship belt, there was also mixed in with all that noise a huge sigh of relief that Wahoo would be coming back to Richmond again to wrestle. This match between Wahoo and Flair ended their epic feud over the Mid-Atlantic Title that began in the summer of 1975. While the two would still wrestle periodically over the next decade, this match marked the end of arguably the greatest program in Mid-Atlantic Championship Wrestling history. 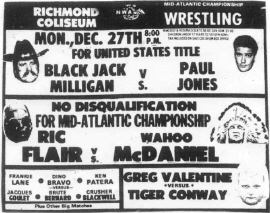 After this classic bout in Richmond, Ric Flair would never again hold the Mid-Atlantic Title, and for the next few months thereafter concentrated on being one half of the World Tag Team Champions. Wahoo would use this match as the springboard for his most dominating period while in Jim Crockett Promotions, holding the Mid-Atlantic Title for the first half of 1977 in ultra impressive fashion. This match in many respects set the course for the promotion for the highly successful year of 1977. Like his buddy Ric Flair, Valentine was riding high when he entered the Coliseum this night. After being in the area for only three months, Valentine was now one half of the NWA World Tag Team Champions. Most in attendance didn't seem to give Tiger Conway much of a chance in this match. Tiger almost surprised us all! This match rivaled the Flair-Wahoo match in many respects. It was that good. While Tiger was an upper mid-card competitor at this point in time, he clearly brought his "A" game to the Coliseum this night. And perhaps Valentine was a bit overconfident. At any rate, Tiger dominated the majority of this match and captured an untold number of near falls on the "Hammer." 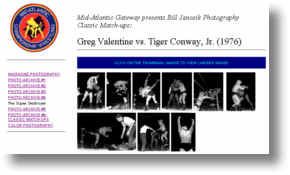 The bout between these two was a classic contrast in styles, with Tiger pushing a fast pace with maneuvers off the mat, while Valentine was slow and methodical and tried to beat Tiger into submission. While Tiger's style prevailed for the majority of the lengthy bout, he seemed to tire more than Greg as the match wore on. A fatigued Conway fell victim to a vicious kick to the abdomen, and from there a devastating bionic elbow from Valentine while perched on the second turnbuckle ended Tiger's night. While the outcome of the match may not have been surprising, the match itself was outstanding and tremendously competitive. For sheer non-stop action, this may have been the best match of the night. It was definitely entertaining. Six man tags were not terribly commonplace at this time, and the match itself in this format was a treat. Ken Patera was not a Mid-Atlantic regular at this time, but he was welcomed back warmly by the Coliseum fans. Dino Bravo seemed to spend the longest stints in the ring, and Dino ultimately got the win for the "good guys" by taking the fall on Brute Bernard, who looked old and feeble in this match. The most impressive wrestler in this match though, was Crusher Blackwell. Performing maneuvers that belied his huge size, Blackwell's agility amazed those in attendance. While he ended up on the losing team, the big man raised more than a few eyebrows on this night. The veteran Danny Miller won by submission over a surprisingly tough Doug Somers. This was a competitive match, with Somers coming very close to pulling the upset. Was it the young Somers improving, or the older Miller continuing to slide? Probably a little bit of both. Tony Russo got the win over young Joey Rossi, and any pinfall win by Tony Russo was of note. Tony just didn't win often! Rossi always seemed to give maximum effort, as he did this night, but he could never seem to get over the hump. The curtain raiser pitted Richmond's favorite "bad guy" George "Two Ton" Harris battling Francisco Flores. "Two Ton" was at his best, and got the massive crowd geared up for what would be an historic night of wrestling as only he could do. Flores won the match; "Two Ton" won our emotions. See photos from the Valentine-Conway match in Richmond in the Bill Janosik Photo Album.